Know what I love lately? Instagram polls. In my Instagram stories, I’ve been asking lately for votes on what you want to see next. It’s so fun for me to see your votes! 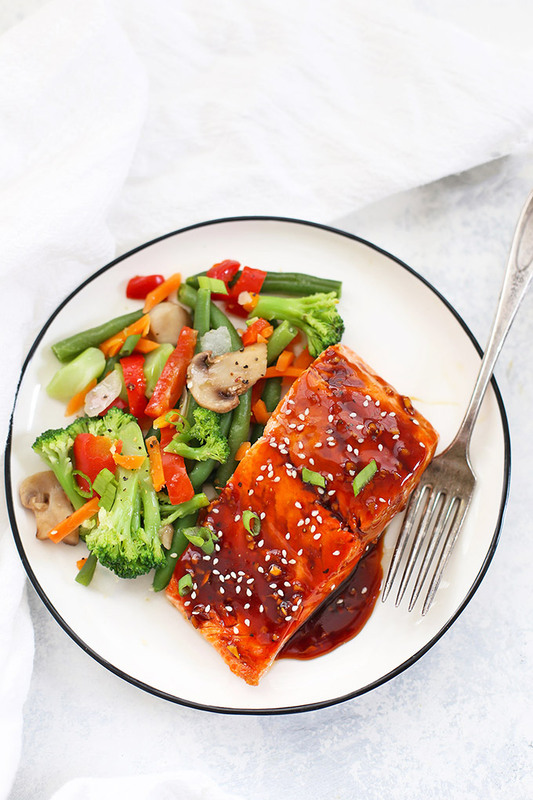 After a Costco run recently, I asked whether you’d like to see Cilantro Pesto Salmon or Sesame Ginger Salmon. It was a TIGHT race–as in 50-50, then 49-51, then 51-49. We finally settled at 46% Cilantro Pesto Salmon vs 54% Sesame Ginger Salmon. For the glaze, I combined tamari or coconut aminos (I tested both–you could also use soy sauce) with some honey, ginger, garlic, sesame oil, and a splash of vinegar. 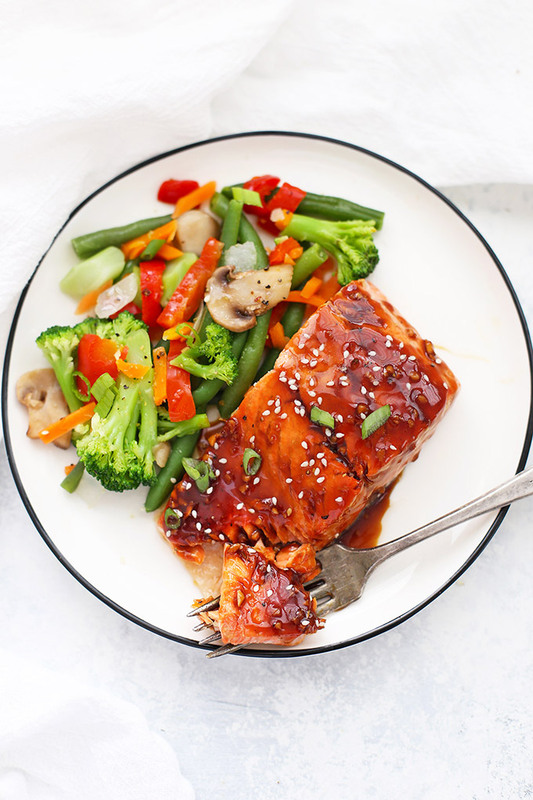 I love how the sauce hits all the right notes, and a little thickener turns it into a beautiful, sticky glaze that’s SO good on top of the salmon. To keep things speedy, I opted for pan-searing the salmon. 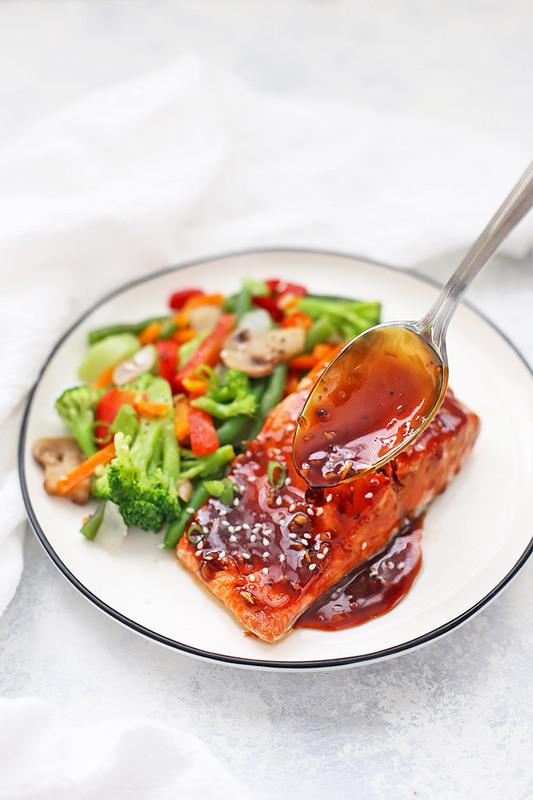 It’s super fast (we’re talking 4-5 minutes per side, depending on how thick your salmon is), and the glaze only takes 5-7 minutes to put together. If you steam or stir-fry some veggies to go along with it, your dinner is done in a flash. And boy is it delicious. It was so good I may or may not have had leftovers for breakfast. Whether you serve this over a bed of white rice, cauli rice, or next to a plate of veggies, this speedy-quick dinner is one you’ll want to add to your busy night rotation! Watch That Sodium! Any time you’re using a soy sauce (or gluten free tamari) you want to watch out for sodium. I always recommend using a reduced sodium or low sodium version of whatever soy sauce or gluten free tamari you’re using. I don’t usually find this an issue for coconut aminos, which tends to run lower in sodium and has some sweeter notes to balance it out. Paleo Notes – A few easy swaps make this easily paleo-approved. You’ll want to use arrowroot in place of cornstarch, cider vinegar in place of rice vinegar, and coconut aminos in place of GF tamari/soy sauce. Arrowroot vs. Cornstarch. Both thickeners will absolutely work in this recipe. Cornstarch is easiest to work with, so if you don’t have dietary concerns or corn allergies, I recommend going with cornstarch. Arrowroot works very well, but you’ll want to watch it. If it bubbles too long, it can get a bit gluey. If you accidentally get thicker than you meant to, simply whisk in a bit of water to thin things out again. In a small bowl, whisk together cornstarch (or arrowroot) with 1 Tbsp water. Heat olive oil in a saucepan over medium heat. Add ginger and garlic and cook 1-2 minutes, or till fragrant. Add tamari (or soy sauce or coconut aminos), honey, vinegar, sesame oil, and pepper and cornstarch/water mixture. Stir over medium heat 3-5 minutes, or until thickened. Set aside. While you’re working on the glaze, heat 1 Tbsp oil in a saute pan over medium heat. Add salmon and cook 4-5 minutes per side, or until cooked through. 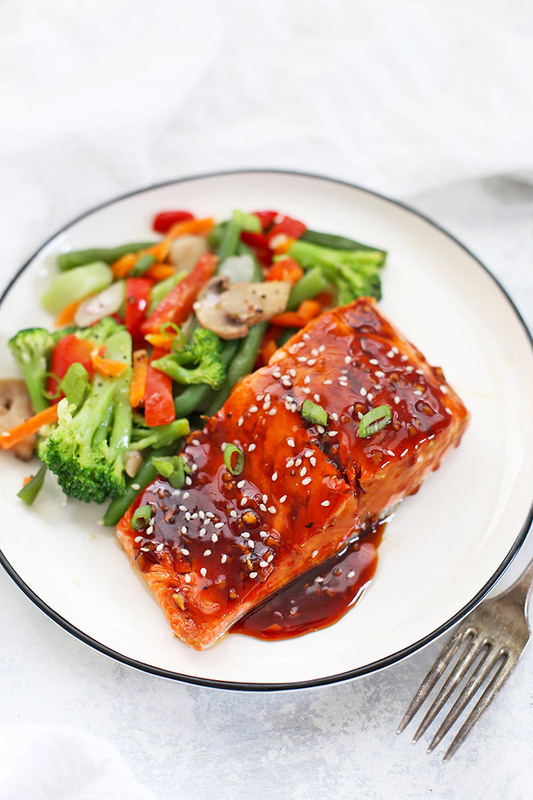 Drizzle salmon with glaze, sprinkle with sesame seeds, and garnish with sliced green onion or cilantro, if desired. WATCH THAT SODIUM – Any time you’re using a soy sauce (or gluten free tamari) you want to watch out for sodium. I always recommend using a reduced sodium or low sodium version of whatever soy sauce or gluten free tamari you’re using. I don’t usually find this an issue for coconut aminos, which tends to run lower in sodium and has some sweeter notes to balance it out. If your sauce ends up a little salty, you can thin it out with a little water, or add a bit more honey. ARROWROOT VS CORNSTARCH – Both thickeners will absolutely work in this recipe. Cornstarch is easiest to work with, so if you don’t have dietary concerns or corn allergies, I recommend going with cornstarch. Arrowroot works very well, but you’ll want to watch it. If it bubbles too long, it can get a bit gluey. If you accidentally get thicker than you meant to, simply whisk in a bit of water to thin things out again. « Easter Basket Ideas for Kids – Besides Candy!